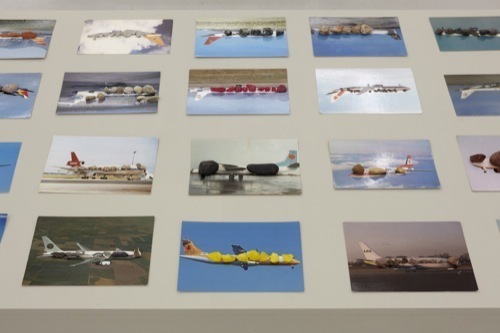 Runo Lagomarsino, OtherWhere, 2011, 168 postcards and stones, 6 painted wooden tables, dimensions variable. This intricately composed show of work by international artists living between two places is deeply self-reflective about the ways that human habitation is fundamentally shifting before our eyes. The nomadic art world is a relatively privileged site from which to observe these shifts, but it operates on many of the same principles that dictate mass migration and population relocation: opportunity, flexibility, annual patterns of movement, and an ever-increasing economically driven need to be able to be in more than one place at a time. Here, sites overlap both in a literal sense, as in When 2 Places Look Alike, 2012–13, Clarissa Tossin’s study of Ford factory towns in Michigan and the Amazon forest that offers worker-housing analogues, and at a more abstract level: Formal layering and overlapping dominates the show, whether between the interactions of living and taxidermy birds in Dana Levy’s Silent Among Us, 2008, or in the surprisingly affecting small pebbles covering the windows of airplanes on postcards in Runo Lagomarsino’s OtherWhere, 2011. The lodestone of “Lives Between” is Enrique Ramírez’s International Sail, 2017, a tattered and heavily mended sail from a one-person Laser sailboat. Mounted upside down to both disorient and point to the global south, it yields a rich metaphor for precarious international workers caught up in currents, winds, and tides beyond their control. The overall curatorial argument suggests that, increasingly, the model for living between forgoes simple back-and-forth trajectories, demanding instead a simultaneous absence and presence in multiple places.